Sub assemblies are used to build multi-leg chain slings (or even wire rope slings). These sub assemblies from Crosby are made from forged, Grade 100 alloy steel that is Quenched and Tempered. Each assembly is proof-tested as part of the manufacturing process and certificates are available at no additional charge. 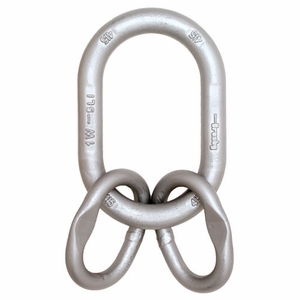 The flat spot on the link is engineered into the design, and it allows for the use of S-1325A Chain Couplers. Safety factor of 4:1.